Fifty animated classics featuring Bugs, Daffy, Porky, and more are bound for Blu-ray in two editions this November! 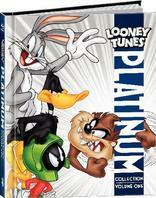 In an early announcement to retailers, Warner Brothers is preparing a special 'Looney Tunes Platinum Collection: Volume 1' for Blu-ray on November 15. 50 of some of the greatest Looney Tunes cartoon are together for the first time on Blu-ray. Releasing in a digibook with rare images and a cartoon guide by historian Jerry Beck, this collection has been digitally restored and remastered. This 3-disc collection contains some of the franchise’s most enduring shorts featuring all your favorite Looney Tune Characters! Also available will be an Ultimate Collector's Edition which will add a character collectible glass featuring Bugs Bunny, souvenir tin sign magnet featuring an image of Bugs Bunny and Daffy Duck, framed litho-cel featuring your favorite Looney Tunes characters, and more all housed inside a slip box with a certificate of authenticity! Suggested list price for the digibook is $59.96 and the UCE $79.98. You can find the latest specs for 'Looney Tunes Platinum Collection: Volume 1' linked from our Blu-ray Release Schedule, where it's indexed under November 15.